Sometimes I'm caught in the middle, caught in between appreciation and apathy. Sometimes I expect, all along, to be caught in the middle. Chocolate Santander sounds very familiar to me, but I don't believe I've ever tasted any of their products. 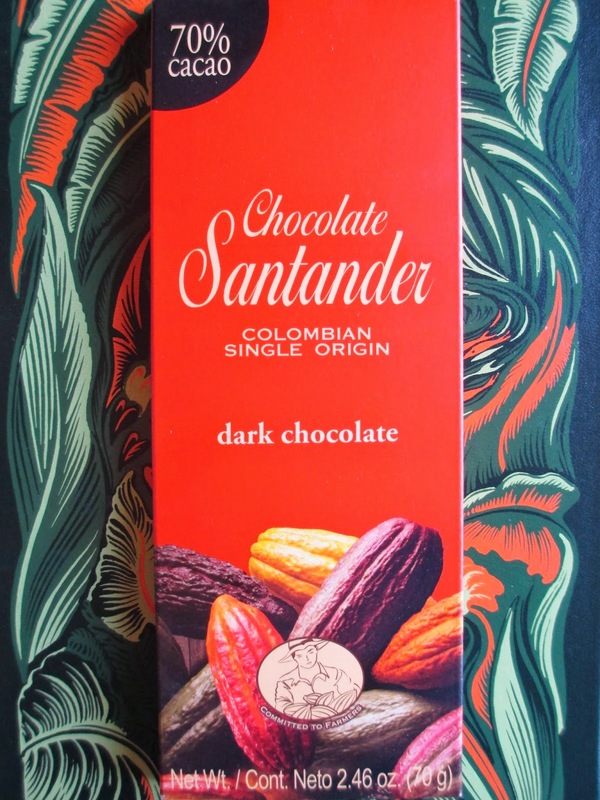 After finding the same offerings from Lindt, Ghirardelli, Chuao, Kinder, and the store brand at World Market, I noted Chocolate Santander in a display; here was something different. But something good or not? The packaging is ambiguous. It's plain, tasteful but not quite as polished as some brands; it looks just a step above grocery store chocolate's packaging. Yet still there are things to note from the outside. One, we have both the cacao percentage (70%) and the origin (Columbia) listed; yes, those are elements listed more and more frequently these days, but it remains a good sign. Two, there is a "Committed to Farmers" label; when a company works with the farmers, that's generally a sign that they're investing enough in one aspect of quality that they probably also are in all aspects. Three, I believe this chocolate is not only grown in Columbia but made there, as well. The chocolate bar (which is darker and less red in color than it appears in the pictures) is smooth, divided into eight squares. It's kind of elegant. A clean break on the chocolate reveals a texture in the mouth that is as much as smooth as the appearance. It's so very smooth that I want to call it too smooth, yet it's a different smoothness to the plasticy, over-smooth kind of cheap chocolate. I think they must just give this chocolate a very long conching time. At first, I thought the chocolate was without much dimension; I thought it was too sweet and flat for a 70%. But then I tasted again later and again later, and I think I may have changed my mind. The flavor notes do have a bit of redness to them, more fruity than floral, I think, though perhaps not any citrus. There is the slightest, slightest bitter tang in there, and the aftertaste is much like that thick taste your mouth gets after drinking coffee. The first half of the chocolate reminds me of the Trader Joe's Dark Chocolate Lover's Bar in its coolness of flavor and perhaps also in the pace of its melting. Being $4 for a 70 gram bar, I would call its price average. I'm still not sure what I think, though. I suppose I like it. I suppose there are other chocolates that I like more. But Chocolate Santander seems to have a good practice of chocolate production going on, and I could definitely recommend this bar if you want a nice and simple, smooth dark chocolate.